Three years ago, we published our first interview with Matthew Hofmann and his father, asking them questions about being the only licensed architecture firm in the world to specialize in full-service design and renovations of mobile spaces. After recently receiving a newsletter about his latest design, Living Vehicle™, I knew I had to reach out. Matthew and his wife, Joanna design some of the most beautiful trailers I have truly ever seen. Don’t believe me? Just wait. Beginning with Thomas, marketing manager, and ending with Matthew and Jana themselves, this is Living Vehicle. Please briefly introduce Living Vehicle. How did you guys get in the business of building these beautiful small homes? How long have you been creating your products? It all started for Hofmann in 2010 when Matthew Hofmann custom renovated his own 1978 Airstream named Visionary. 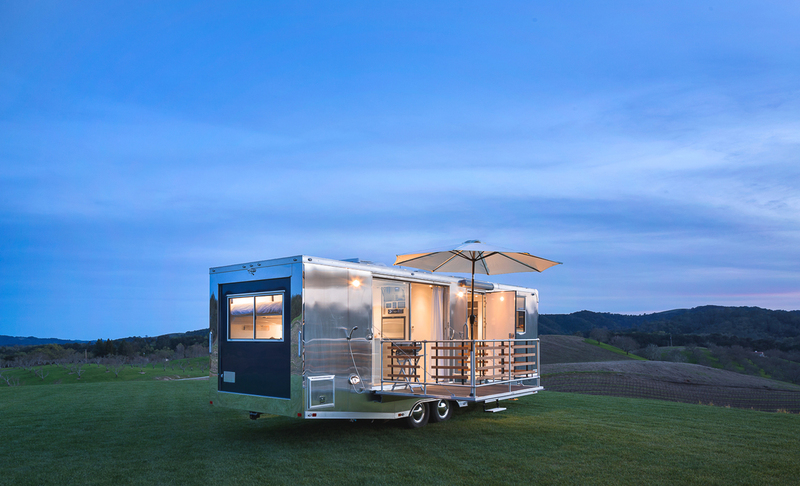 In the next eight years, his team created more than 400 custom mobile spaces for clients all over the world. In 2018, Hofmann sold the vintage renovation build part of his company to his construction manager, opening the way for for him to focus on creating his own ground up build. Living VehicleTM is the culmination of nearly a decade of experience designing and living full-time in mobile spaces. Living Vehicle is an elegant, sustainable and super spacious mobile space for the modern age. Hofmann has inspired and supported a nationwide movement of those who choose to live an adventurous, full-time mobile lifestyle. He has tapped into a generational shift of 35 to 55-year-old freedom-seekers who are are led to live intentionally simpler lives with less stuff, unburdened by mortgages and materialism. Tucked behind the sleek interior is an array of smart home features and spacious comfort that can accommodate six adults. Its onboard amenities include a full kitchen and bathroom; off-grid systems for up to 1 month; dimmable LED lights; a double bed that drops down from the ceiling; Bluetooth and WiFi connectivity; and a Hi-Def video / audio system that provides quality acoustics indoors or out. We caught up with Matthew and Joanna and asked them to share their obvious passion and excitement. Can you tell us a bit about your different designs and products? Which is your favorite? Matthew: After years of experiencing a mobile lifestyle first hand, my wife Joanna and I decided to create a product that allows others like us to live a re-defined American Dream — a dream of living well wherever our hearts take us. For the past few years we have been alternating between living on a 38’ boat in the Santa Barbara harbor and on the road in a Living Vehicle. Our designs are driven by both functionality and beautiful aesthetics that make the space feel like home. Joanna: It’s tough to say which Living Vehicle space is my favorite, but if we’re parked somewhere looking over the ocean, a lake or expansive forest, then the sundeck captures my heart. I also love the teak-lined shower with rainwater tower and sky light. No matter where we are, it’s always such a cool experience to look up at a blue sky in the morning or stars at night. M: We’re also focused on finding real-world solutions to the challenges of living off-grid without “roughing it” — comfort and safety are the principles that guide our designs. Today, we travel full-time and live in the same Living Vehicle we’ve designed — and continue to improve on and build — for others like us. What is your inspiration behind your home designs? Is every design different? M: Living Vehicle offers full-time mobile living with features to support an intentional lifestyle, and it checks-off all of the boxes for the adventurous individuals and families, pampered pets or a workplace on the go. There’s an unmistakable sense of openness and the outdoors when you walk inside. As an Architect, I’ve been trained to design based on principles that naturally guide the eye to open spaces – that’s why we have created an abundance of natural light through windows, skylights and doorway openings. J: I think one of the most valuable solutions LV offers is how well it connects us with nature. Its large windows, skylights and outdoor deck encourage an active, outdoor lifestyle with the comforts of a high-end hotel suite. How do you decide which products to use in your builds? M: Our decisions in LV start with products that are honest, add beauty, and are sustainably sourced. The comfort features must add to our aesthetic senses without giving off any VOCs. Where possible, our products must be made in America. The electrical, water and propane systems must be robust and reliable. We’re living a sustainable life, so we’re very conscious about wasting any resources. Since we’re on the move, we want the space to be lightweight. Our design choices are a balance of function, style and refined convenience. I love the side door deck feature you offer! Can you elaborate a bit on this feature? M: Sure, I’d love to! The outdoor deck fits perfectly with our intentional goals of experiencing the environment wherever you are. So many homes and mobile spaces don’t provide personal connections with an outdoor experience. As we travel the country in LV we’re constantly drawn to the deck for morning coffee or evening drinks. The idea of a deck is a historical homage to the front porches of the Craftsman Home Era. These spaces provide a great way to reconnect with your neighbors and meet new friends! J: The deck comes in two options: either the expanded deck which hinges down from the bottom, or the clam shell deck where half swings down for a deck and the other half swings up to create an instant awning. Both decks include an easy-to-add railing which is perfect to corral young children or pets. Do you guys ever hit the road in any of your custom built vehicles? If so, where is your favorite place you’ve traveled? J: Absolutely. Hitting the road is our happy place. In California, I love going up Highway 1 to Big Sur. The Pacific Ocean coastline is so rugged and the views are spectacular. During the winter and spring, the night skies are usually clear and the hiking is amazing. M: I was raised in the mountains, so when I get the chance I head back to my hometown, Mammoth Lakes, CA. I love the drive up Highway 395 through the sleepy little towns. There’s thousands of acres of BLM land, too, so we can find a quiet place to spend a few nights in the shadow of the tallest mountains in the US. At night there’s no better place on earth to view the night sky than the Eastern High Sierra. J: Since we both love mountain biking, hiking, snowsports and craft beer (!) going to Bend, Oregon is another favorite spot to travel, too! Do you give any specific advice to buyers when they purchase a new home and begin the process of downsizing and minimal living? J: Hah, for sure! First, you’ll need to break the Costco addiction! You really don’t need 48 rolls of paper towels or a barrel of Cheetos. If you have a walk-in-sized closet of clothes and shoes then you should start there, but trust me, it’s not that painful. There are so many benefits to scaling back on things. Keep reminding yourself that having less stuff gives you more time and money to spend on each other. M: The other suggestion we’d offer is to reassess what you really value. For us, a great life isn’t about accumulating stuff — it’s all about experiences. We believe the true measure of success is the amount of freedom and adventure that’s in our daily lives. J: Simpler living offers new ways to experience this wonderful world through places and people. Even our new puppy, Lucca, gets to come along for the adventure! Our best advice is to take a thoughtful look at everything in your world today and ask yourself, “Is this helping me live my best life?” If it is, then keep it. If not, dump it. Check out Living Vehicle online!